We’re never surprised to hear that SketchUp is being used in ways we didn’t expect, but we were particularly impressed when we came across this article about SketchUp’s knack for reconstructing crime scenes. We wanted to learn a bit more about how 3D plays into crime scene reconstruction (and yes, some of us are Dexter fan boys), so we tracked down Detective Albert Schade, the article’s co-author and the mind behind Crime Scene Interactive, a website that details workflows for modeling crime scenes in 3D. How long have you worked with 3D modeling software? I’ve been 3D modeling since the mid 90’s; I got my feet wet with Animation Master and Milkshape: those really broadened my use of computer generated animation and modeling. Since then I’ve toyed with 3D Studio Max, Maya, Blender and SketchUp. So what is "Crime Scene Interactive?" Who is it for? Crime Scene Interactive has gotten a lot of attention since the publication of our article in the Association of Crime Scene Reconstruction Journal. 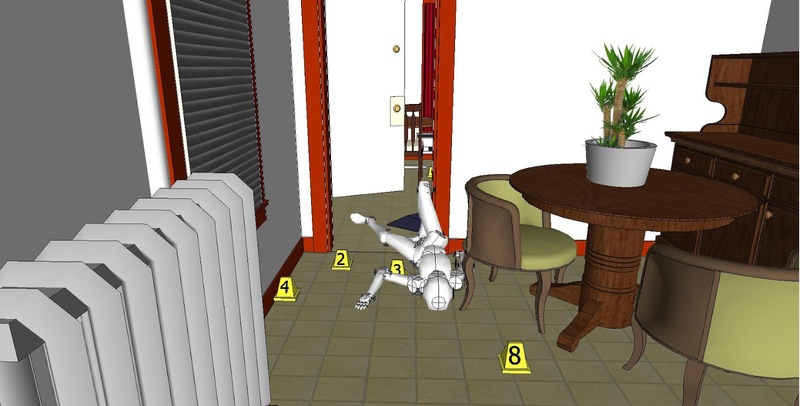 Crime Scene Interactive is a workflow that allows you to make interactive courtroom exhibits through the use of SketchUp, Blender, Gimp or Photoshop, Ultimate Unwrap3d and the Unity 3D game engine. 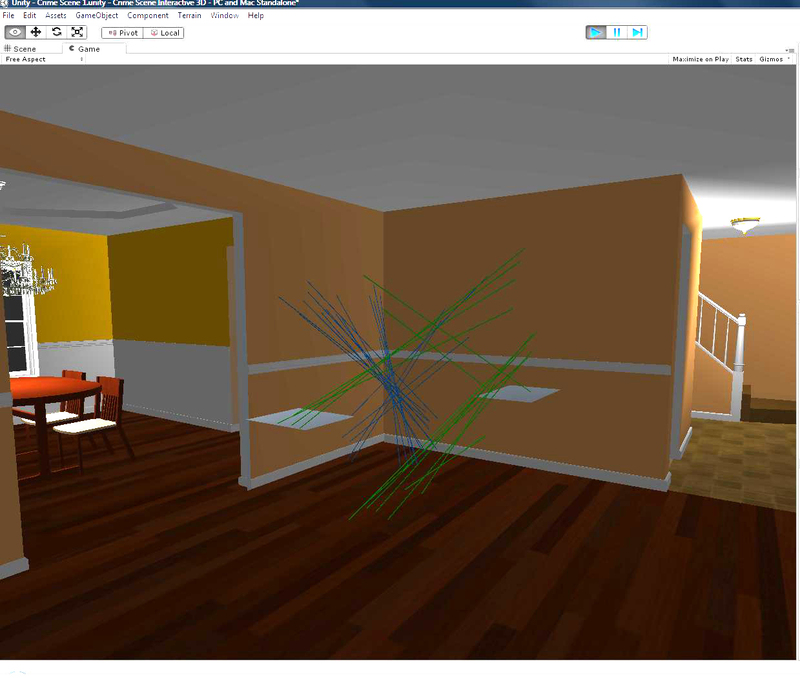 SketchUp, in particular, is a huge part of that workflow thanks to its ease of use and the ability to quickly model in real world measurements. SketchUp also happens to be very expandable with the ability to add features via Ruby and its nice assortment of import/export options. What role does 3D modeling play in your detective work? I’m a Detective in the Forensic Services Unit for the Berks County District Attorney’s Office. I investigate homicides, serious bodily injury cases and fatal crashes. I also instruct police officers in fingerprint comparison, blood spatter, evidence processing, and 3D crime scene creation. 3D modeling is a great way to make exhibits for all of these disciplines. In law enforcement, we face several hurdles when bringing cases to court. During evidence collection and processing we obtain a large amount of information. When we testify in trial, we need to relate that information to juries -- groups of people with very diverse educational backgrounds -- in a very short period of time. Demonstrative exhibits help visually display that information. So 3D models and walkthroughs are incredibly useful for taking the vast data we’ve collected at a crime scene and relaying it in court so that a jury panel can make an informed decision. Depending on the victim condition or amount of blood in a scene, judges will sometimes not allow actual crime scene photos in a courtroom. 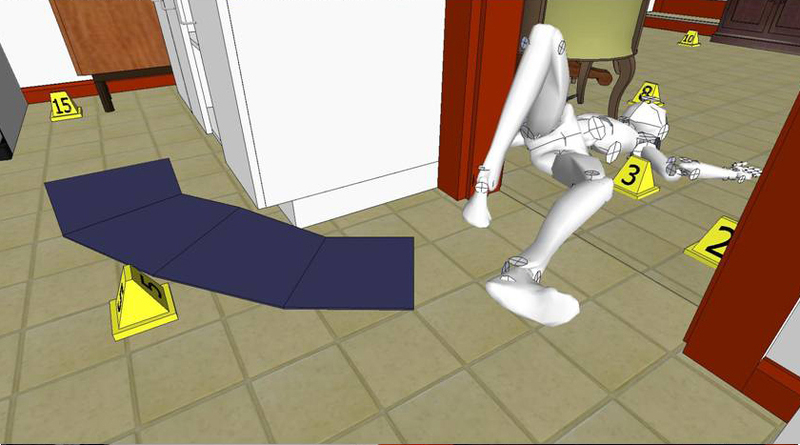 SketchUp models afford a neat and clean depiction that still articulates the positioning of the victim. 3D is also important for investigations. Most people don’t realize that police departments spend a lot of resources not only proving what did happen, but what didn’t happen. In pursuit of the truth, rapid availability of reconstruction information helps us decipher witness or suspect statements. We can focus on the right people and not waste time on bad leads. How did you first come across SketchUp? I first used SketchUp for personal projects. I like woodworking, so I used SketchUp with the Cutlist plugin to help organize my project and develop a shopping list. Learning how engineers and various other artists and professionals around the world were using SketchUp is what led me to start using it for crime scene work. Now, SketchUp fits perfectly in my workflow. With a large caseload, I need to keep investigations moving. 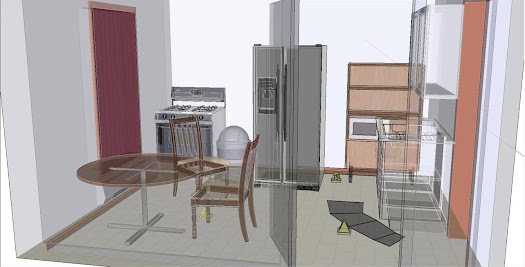 With SketchUp, I can mock crime scenes very quickly, and then communicate the spatial relationship of items in the scene to other investigators in a clean, concise fashion. From there, we can start the process of testing theories and corroborating witness accounts to physical evidence. Small apartments often make photography and camera views difficult to share. 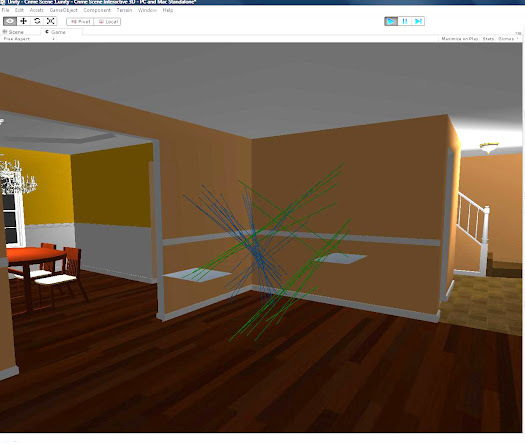 SketchUp's X-Ray mode provides a good overview of a room and makes it easier to navigate the 3D space. Are there specific tools in SketchUp that are particularly helpful for your work? LayOut is a great tool for turning sections of scenes into illustrated visuals for a presentation slide. SketchUp Pro’s reporting function is also very useful, because I often have to provide defense attorneys with data that shows my scene model is accurate. The report option lays out this data in a spreadsheet, saving me a lot of time. The ability to export models to .FBX format is also important because I currently use the Unity game engine to animate interactive walkthroughs of a scene. The DXF import option also helps because some of our measuring equipment saves to DXF; that import ability makes it easy to load control points directly into SketchUp Pro. It sounds like you use several 3D tools in cooperation with SketchUp; what else is in the quiver? I use Blender to make human models animate and any organic models that would otherwise be difficult to create in SketchUp. HemoSpat is a blood spatter analysis suite that allows me to create a 3D model of a bloodletting event’s area of origin. It can then be imported into SketchUp for placement in the crime scene model. A SketchUp model (running in Unity 3D) with the blood spatter model accurately position. The lines show the trajectory of the blood, and where they intersect shows the area of origin in 3D space. I also use Unity, a game engine that brings crime scenes to life in an interactive animation. This lets you walk through the crime scene in a courtroom just like a video game. You can interact with items of evidence, and display images from the crime scene in relation to the model. I am waiting to see SketchUp featured on CSI or Bones! is a crime asking to trimble about sketchup 9? Hi guys. 2 months without blog update. The new version is comming? Management Development Training - Business has changed forever. Let us help you develop more sales opportunities and more accountable leadership teams with our management development programmes, training and workshops. You know that google adsense is very strict in these days we are using genuine method so grab your account now. Google adsense terms have been strict for india and other asian countries for the last few years.So,it may be difficult to get adsense account in india for you,it takes 6 moths or later,....but don’t worry we will get you adsense approval within 6 hours. When you mail me, send your contact number,payee name(in this name you will receive cheque),full address with Pin code(address You receive Cheque),date of birth. You can pay me Rs.700 after I send the screenshot of your newly created gmail adsense account through mail. After paying i will tell you new adsense account username & password. Good to know about this blog and thanks for sharing here with us.